Student nights in Liverpool are known to be something else! And when it comes to planning the ultimate student night out, at Arthouse Hotel we’ve got you covered. Arthouse Hotel is Liverpool’s go-to destination for a memorable stay in the city. Our movie-themed hotel is the perfect place for staying with your mates and getting ready for a night out in Liverpool in style. Our picture-perfect rooms are ideal for getting some Insta snaps of your night, so if you’re celebrating a birthday or special occasion, look no further than Arthouse. Rooms at Arthouse Hotel are designed to sleep groups of guests for the ultimate group stay. You’re never too old for a sleepover with your best friend, and our rooms are perfect for just that! Our themed rooms range from Marilyn Monroe and the Grease room to Rocky Horror Show. We always have a wide range of special offers available for you to enjoy, making your visit affordable and convenient. So, don’t miss our latest offers here! Our rooms are fitted with fabulous whirlpool baths, so you can enjoy a pamper in between your night out. Our Skyline Suites feature a giant whirlpool bath – ideal for large group stays. What better spot for relaxing with a glass of fizz before you head out to explore Liverpool’s nightlife scene? 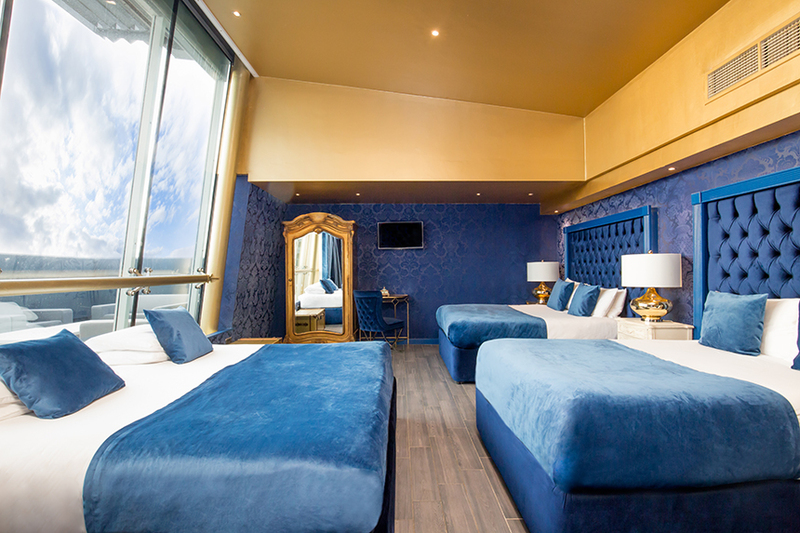 Arthouse Hotel’s Skyline Suites are also home to a scenic outdoor terrace overlooking Liverpool’s skyline. What better backdrop to your stay in the heart of the city? The terrace is fantastic for enjoying the summer months as you make the most of the sun with your best pals. Your student night in Liverpool wouldn’t be complete without some music! Bringing a sprinkle of Broadway magic to Liverpool, head downstairs at Arthouse and you’ll discover Mulholland Singing Diner. At Mulholland, you can enjoy a bite to eat and delicious milkshakes while our talented team of singing waiters serve your meal in style. What better venue for singing along to your favourite musical hits and ballads through the decades? 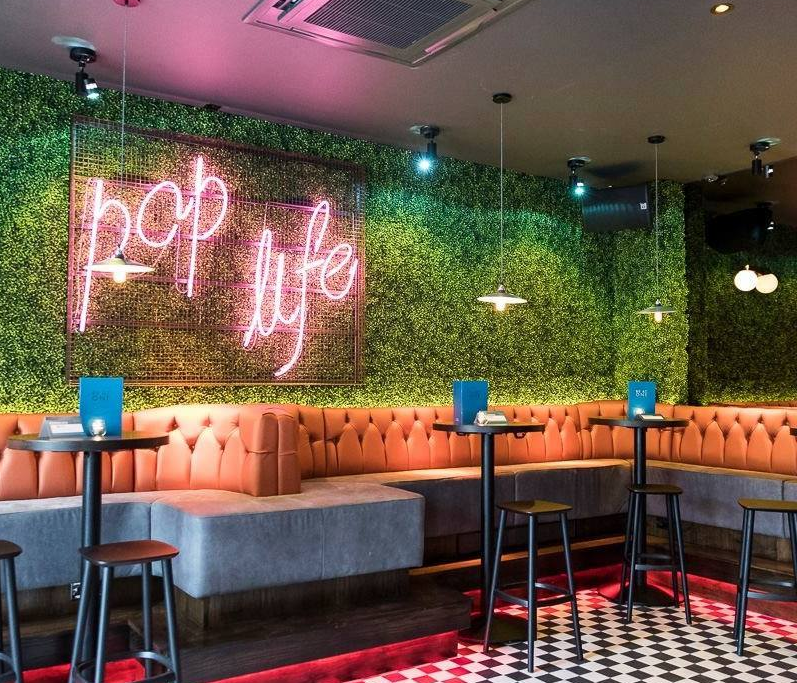 Cocktail deals are ideal for a student night in Liverpool. And you can look forward to a fantastic range of cocktails at Mulholland. We offer an unmissable deal of 2 classic cocktails for £10 every day! 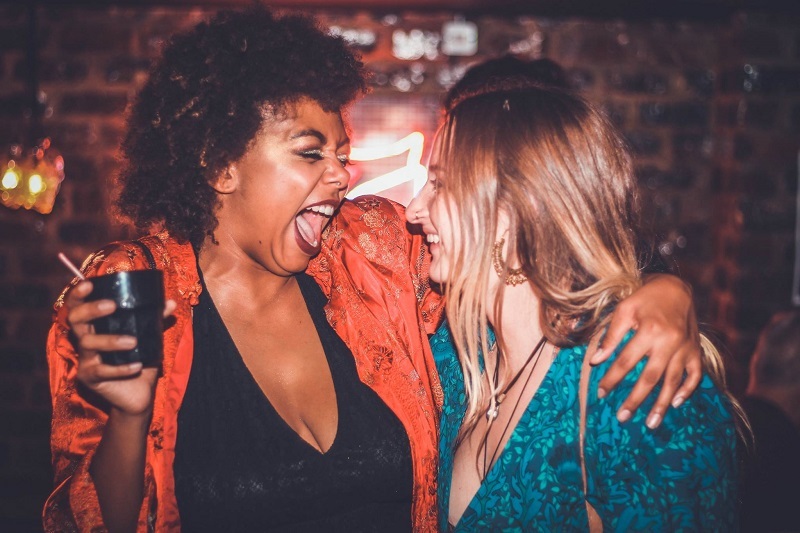 With Seel Street’s bars and clubs right on your doorstep, there’s nowhere better to start your night in style. 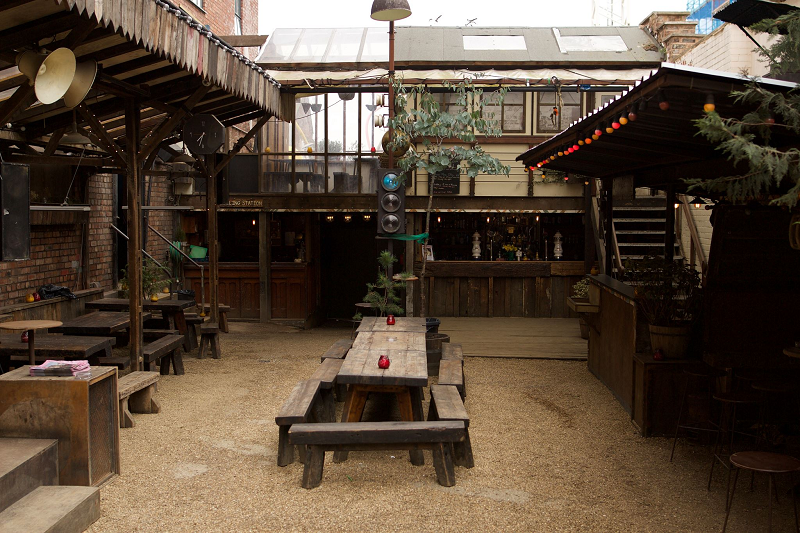 Everyone loves a beer garden during the sunny months! And Seel Street is home to plenty to enjoy. 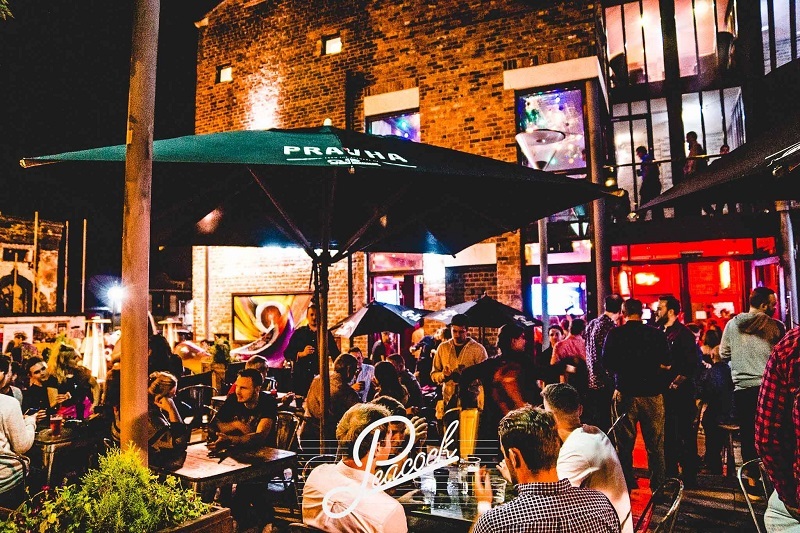 Just across the road from Arthouse Hotel, Alma de Cuba’s beer garden is a firm favourite in Liverpool for sitting back and catching some rays. Alma de Cuba is also the place to be if you fancy spotting some celebs in Liverpool. Love Island star Georgia Steel has been known to frequent Alma, along with Megan McKenna, Charlotte Crosby and some of the best Instagram bloggers in the UK. The stunning venue will add a touch of sophistication to your night with its historic surroundings. But when it comes to partying, Alma is definitely the place to let your hair down! And don’t miss Alma’s petal drop! Have the ultimate night out in Liverpool by catching Alma de Cuba’s famous petal drop in action. The Cuban themed venue will dazzle you with its shimmering samba dancers and fabulous petal drop at the weekend. 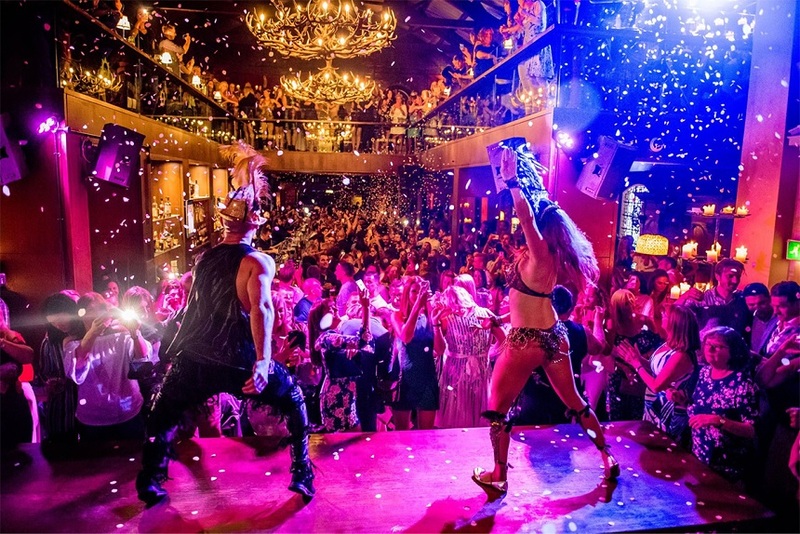 You won’t forget a night at Alma de Cuba! Last but not least, curing a hangover is the perfect excuse for an indulgent breakfast. And Mulholland is known for its dreamy stacks of pancakes and tasty breakfast dishes. What better way to finish your amazing night out in the city? To book your stay with us, a table at Mulholland or at Alma de Cuba, simply get in touch today on 0151 236 1066. One of the most popular nights for office Christmas nights out and the last weekend before the festivities begin, we’ve put together a guide to Mad Friday on Seel Street in Liverpool. This year, Mad Friday falls on Friday 22nd December, so it’s time to start planning where you’ll be spending one of the busiest nights of the year. 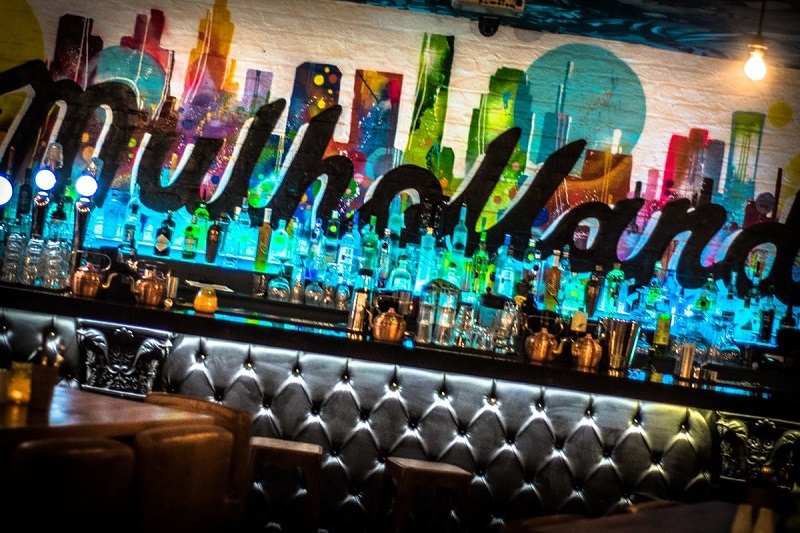 One of the coolest bars on Seel Street, Mulholland is the perfect destination for a boozy Mad Friday night out. A cocktail lovers heaven, set on Seel Street, Be At One is quirky bar perfect for anyone who’s into their mixology. They offer pretty much every single type of cocktail you could ever imagine, that’s a staggering 150 different types of drink, from classic favourites, decadent ice cream concoctions and mocktails to suit every taste. 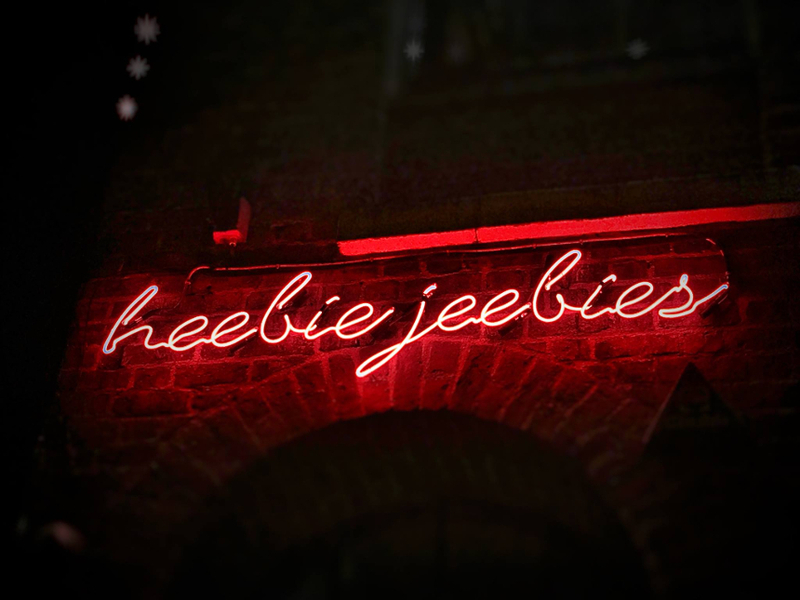 The ideal place to start your Mad Friday on Seel Street. On Mad Friday, you’ll be able to sip on their delicious range of mulled drinks and really get into the Christmas spirit. The ideal destination for a late night tipple on Mad Friday on Seel Street, The Peacock features a large beer garden and various floors to enjoy a range of music genres. Sure to be very busy, they offer offers cheap eats, delicious cocktails and amazing drinks deals that will have you dancing the night away until it closes. This stunning converted church is sure to be the highlight of any Mad Friday on Seel Street. Beers galore, delightful cocktail concoctions and a superb mix of music across three floors, Brooklyn Mixer is one of the top destinations for Mad Friday on Seel Street. Known for its ‘big beats’ and cheap drinks, this venue hosts regular DJ’s one the different floors, perfect for having a boogie. 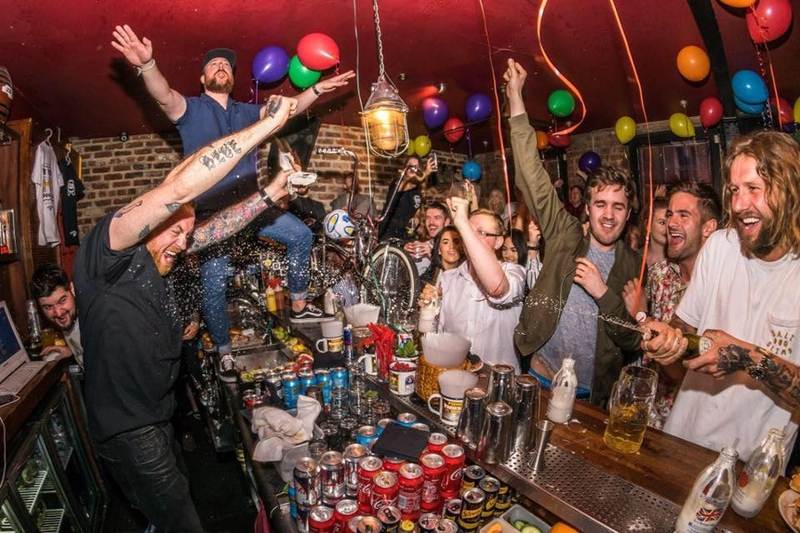 The perfect place to send an alternative Mad Friday on Seel Street, EBGBs has been designed as a chilled out biker inspired bar room with high quality drinks as well as the cheap and cheerful bottles. 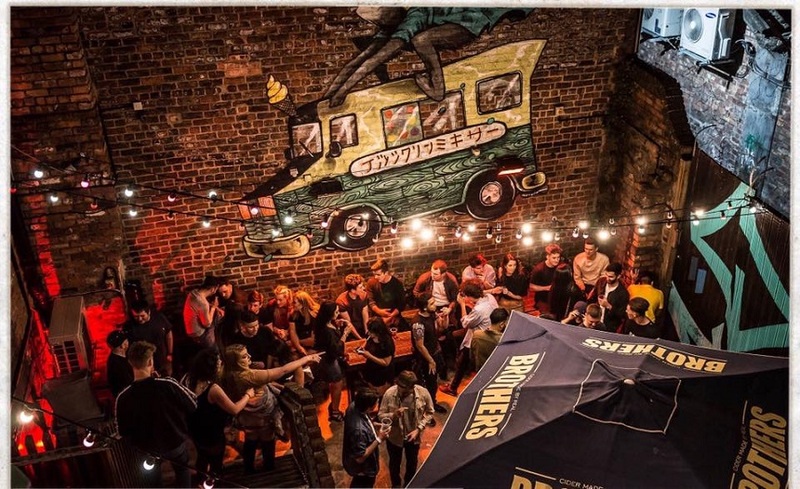 Serving an amazing range of beers, ales, cocktails and spirit, this resident dive bar is a favourite in Liverpool. You can also visit their secret cocktail bar upstairs for the ultimate Mad Friday on Seel Street. Expect eclectic DJ nights and live music with amazing drinks deals, this is one of the best places to visit on Mad Friday. You’ll have to get in there early though, as the queue can usually go all the way around the block! If you’re looking for Mad Friday hotel rooms in Liverpool, then look no further than our magical Skyline Suites. At Arthouse Hotel, we’re renowned for our dazzling party rooms and stylish group accommodation. And what better way to celebrate this crazy night of the year than with a stay in the Skyline Suites? Sleeping up to 12 people each, these stylish suites are interconnected, so larger groups can book the whole floor. Fitted with everything you could wish for and luxurious features, you’ll be able to keep the drinks flowing with your own private bar. 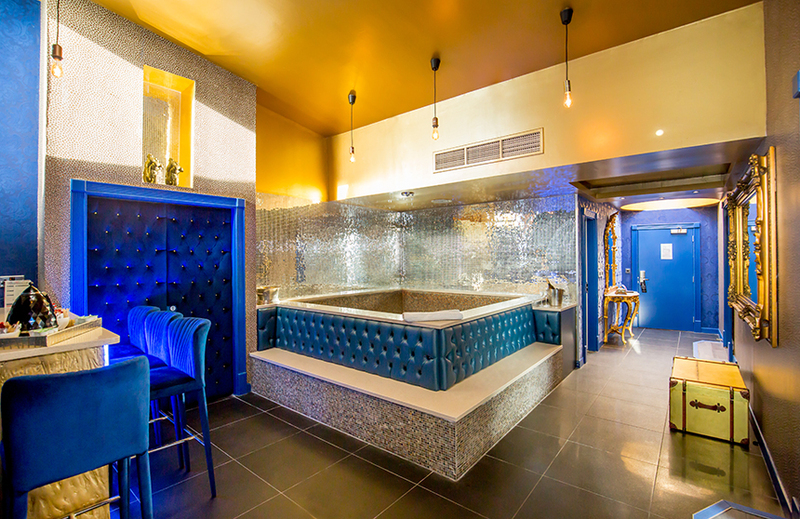 You can also toast to the night ahead as you sink into your large whirlpool bath, perfect for pampering and partying before you head out. They couldn’t be the Skyline Suites without a view of the Liverpool skyline, step out onto your terrace and look out across the city as you take in unrivalled views across the city centre. To book your stay in the Skyline Suites or Arthouse Hotel for Mad Friday, get in touch with our friendly team today.